Yarn: Premier Yarns The Deborah Norville Collection, Serenity sock yarn. In colorway Amethyst. Pattern: Modifications from various patterns and the lace pattern was from Wendy Johnson's Socks from the Toe up - Labyrinth Socks. You are never going to believe this but I actually finished a project (Ravelry Link)! I wanted my intro back into knitting with a small project. Something that would challenge me but also be an easy knit to ease my way back into the knitter’s world. And because I’ve wanted a pair of finger-less mitts for a while now I thought this would be the perfect little project! I have never knit thumb gussets or knitted fingers; and the minimal mathematical calculations to figure out the lace pattern with the modifications of various fingerless glove patterns all gave me enough to think about without having me overwhelmed with a “first-again” knitting project. 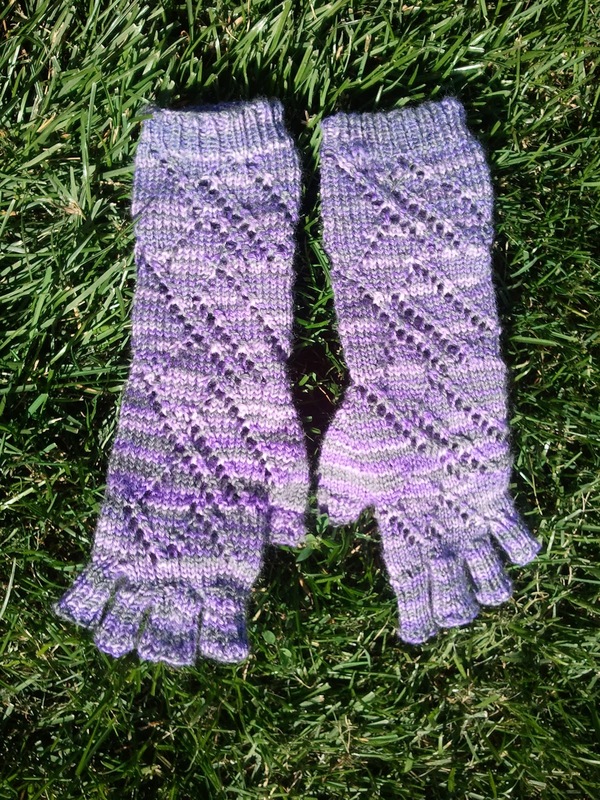 Originally I looked for a pattern for arm warmers or fingerless gloves and realized I didn’t really like any that I saw. I mean, I liked some of the constructions, some of the shaping structures or the descriptions. But overall none really appealed. So I ended up taking bits and pieces from 5 different patterns and wrote up my own fingerless glove pattern. 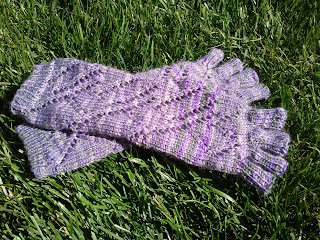 But after doing this I realized I didn’t want to do just plain stockinette stitch so I searched for a lace or cable pattern that would fit in with my modified fingerless glove pattern. I ended up falling for the Labyrinth Socks from the Wendy Johnson's Socks from the Toe Up book. 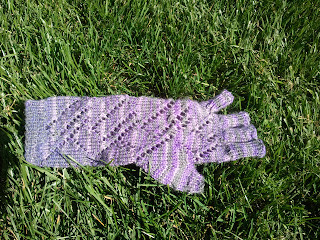 It was easy to convert the lace pattern to fit the glove and walla! I have my very own (modified from other’s) fingerless gloves! Granted it is now 80-90 degrees F outside so I really don’t need to wear these gloves. But in a couple of months I will be working in an office and who knows maybe it’ll be cool inside so I can wear these while at work. Nevertheless, I have a cute pair of fingerless gloves and I’m feeling my craftin’ mojo is coming back! I’m going to go start digging through Ravelry and my knitting book/mag stash to look for the next project. I’ll let you know what I decide! These are a beautiful one of a kind pair of fingerless gloves! They look so cozy and comfy! Beautiful! These turned out great!